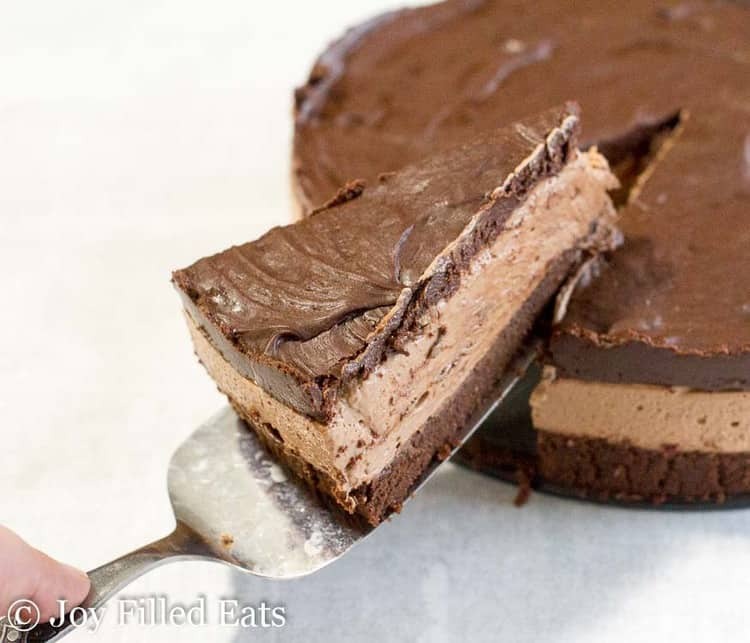 With layers of a brownie batter flavored base, luscious chocolate cheesecake, and a topping of chocolate ganache this No Bake Chocolate Cheesecake Recipe is any chocolate lovers dream. When I saw a video for a no-bake brownie batter cheesecake floating around on Facebook I knew it would be the perfect partner to my no-bake cookie dough cheesecake! Brownie batter is just as good to eat from the bowl as cookie dough is. I had to give it a try as a cheesecake too. Over the years I’ve finally mastered the art of using gelatin in cheesecake. At first, I was afraid to add the hot water to melt the gelatin. Truth. I thought it would water down the cheesecake. So I’d add less water, hot dissolve the gelatin properly, and end up with clumpy cheesecake. Then I tried just adding the powdered gelatin. This works well for a soft set cheesecake. But if you want a nice firm no-bake cheesecake you need gelatin. And you have to dissolve it. Go ahead and add the hot water. It will be ok. You need it. 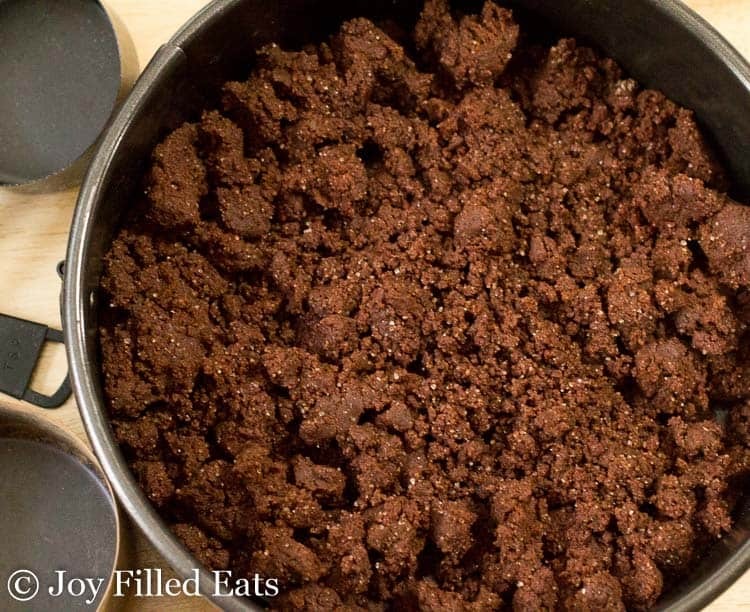 When I starting working on this recipe I used my low carb brownies as a beginning point. I left out the eggs and worked on making the batter into more of a crust texture without losing that brownie taste. I think I did a pretty good job! 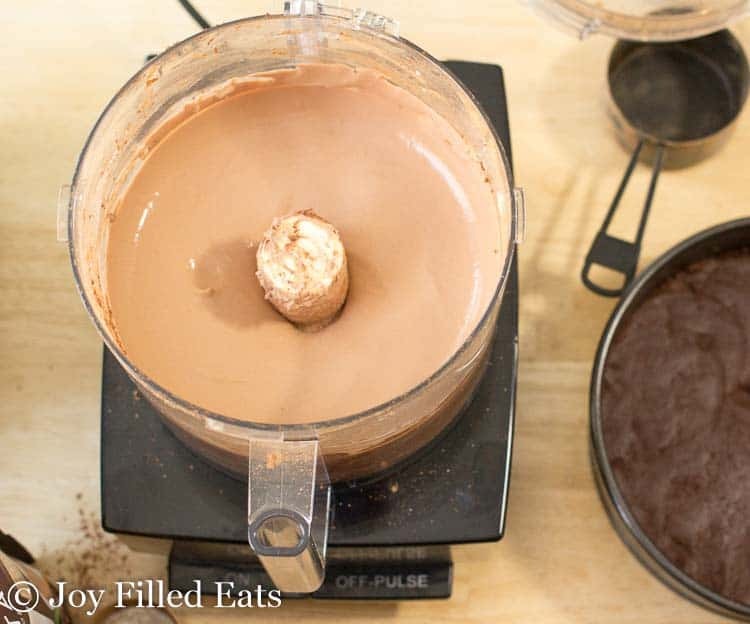 Next up was making the no bake chocolate cheesecake filling chocolaty without being bitter. I decided to add a pinch of baking soda and that did the trick! My tip for ganache is just to mix, mix, and mix some more. As you mix it thickens and gets glossy. You are looking for a smooth, thick, glossy texture. Sometimes I make ganache with unsweetened chocolate, sweetener, and cream but this time I kept it simple and just used sugar-free chocolate chips. 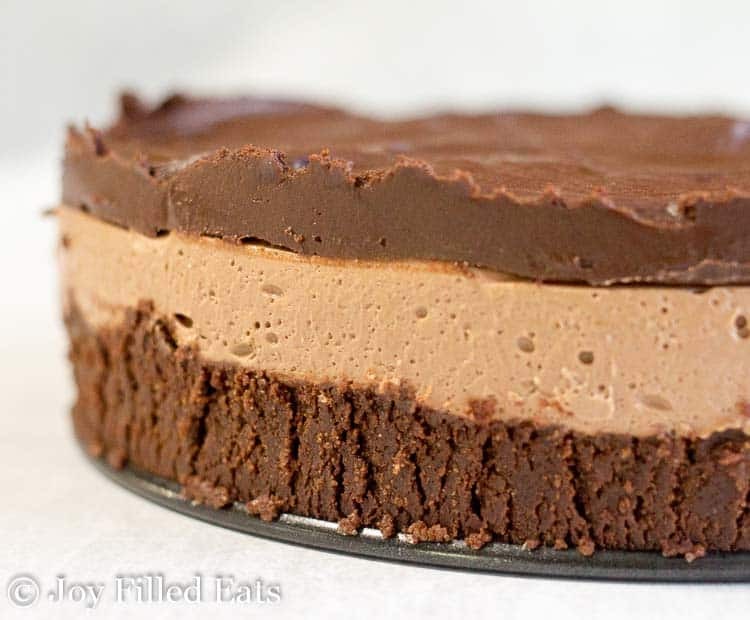 I hope you enjoy this No Bake Chocolate Cheesecake Recipe! 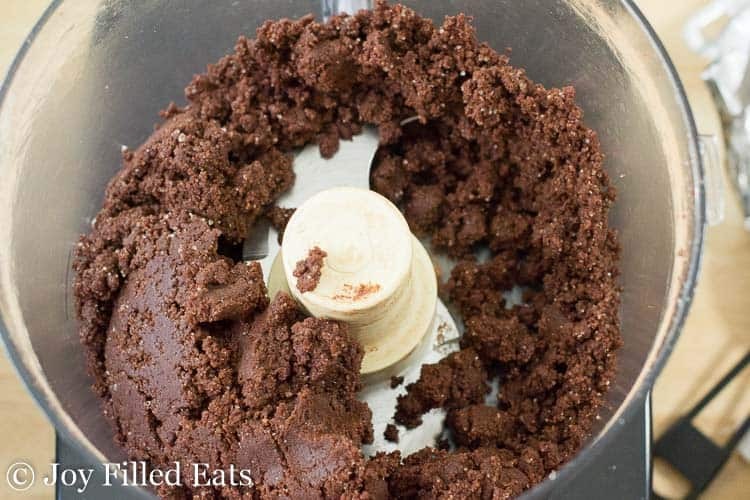 Pulse the ingredients for the brownie batter crust in a food processor until large crumbs form. Press into the bottom of an 8-inch springform pan. Put the cold water in a small bowl. Sprinkle the gelatin on top of the cold water. Let sit for 5 minutes. Add the hot water and stir until dissolved. Add the remaining filling ingredients to the food processor. Process until smooth. Add the softened gelatin. Pulse until smooth. Pour on top of the prepared crust. Refrigerate for at least one hour before adding the ganache. Heat the cream to just before the boiling point. Pour over the chocolate. Stir until it is smooth. Pour over the chilled cheesecake and spread to cover the top. Chill for at least 2 hours or until firm enough to unmold. Wow, phenomenal recipe!! I did have to substitute a bit though. Had no sour cream so I used plain full fat Greek yogurt, and don't tend to like almond flour crusts, so I ground raw hazelnuts to powder and used that instead. Made it taste a bit Nutella like, which wasn't a bad thing. Will be making this frequently, thank you for a fantastic recipe, love that it's no bake! I am going to make this tomorrow for my birthday on Friday but adding in the peanut butter. I will be using a 10 inch springform. How much should I adjust the ingredients by? My pan appears to be very deep. You can multiply all the ingredients by 1.5 which should fill your pan. I'm sorry I'm not familiar with that sweetener. If I’m using Truvia, how much do I use to be the conversion from the 2/3c of the trim healthy mama sweetener?? Truvia is equal to gentle sweet so you use the same amount. Hello! Wanting to sub the almond flour with coconut flour. Is it the same ratio? And someone said I need to change the butter. More or less?! Thanks! If I was going to use swerve, would it be powdered or granular? Either would work but granular may be gritty. Powdered would work better. I made this today and it is to die for!! Something went terribly wrong with the gelatin, though. I followed the directions, but after I let it set for 5 minutes, it was basically a big clump! I added the hot water, but I never could get it to fully dissolve. I stirred and stirred and stirred with a little wire whisk, but there were still little lumps. I went ahead and added to the filling and it seemed like the little lumps turned into huge chunks of hard gelatin balls! I spent 20 minutes fishing them out of the filling. What did I do wrong?? Blooming gelatin does have a learning curve. In the future add more hot water, little by little, until all the gelatin dissolves. 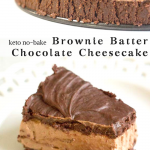 Hi, I asked a question just minutes ago on you homemade Gentle Sweet recipe because I am wanting to make this recipe as well as possibly use this brownie crust in another cheesecake I am modifying for Keto. The other cheesecake uses 24 oz cream cheese, 15oz sweet and condensed milk (gonna swap for homemade keto version), 3 eggs, 1 tsp vanilla, and chocolate chips(gonna use sugar free), with a butter and cocoa/graham cracker(some similar recipes use Oreos) crust recipe. I want to use this brownie crust- am I going to ruin it by baking it? My original recipe calls to form the graham cracker crust in the springform pan, pour the batter in then bake for an hour at 300° and leave in the oven for an additional hour before cooling in the fridge. Is this doable with your brownie crust or do you have suggestions of how to do a replacement for my chocolate graham cracker crust? Thank in advance! I made this twice for the holidays. I used a group of ladies at a potluck for my 'guinea pigs' the first time, and they gave it huge thumbs up. Then I made one for my father-in-law for Christmas. He's diabetic, so keto recipes work well for him. He enjoyed it and put some in the freezer for later. Thanks, Taryn! I don't have sugar free chocolate. 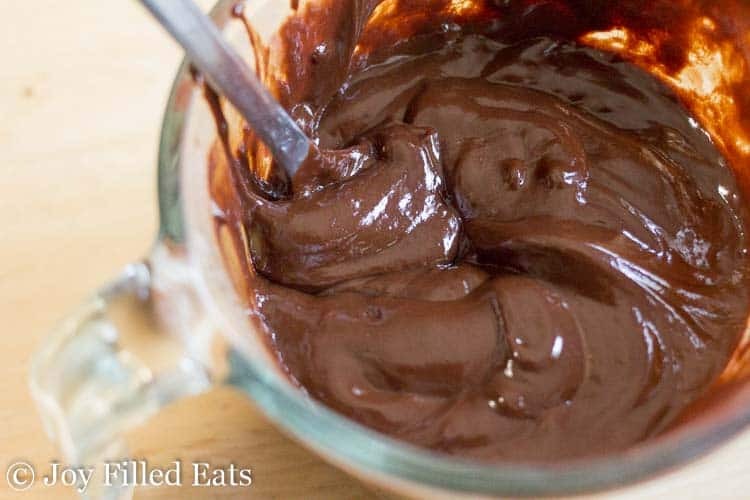 How should I make the ganache with heavy cream, unsweetened chocolate and sweetener? I have a ganache using those ingredients here: https://joyfilledeats.com/raspberries-with-ganache/ You will have to double it to have enough to cover the cheesecake. Thanks! Can't wait to try this. Your desserts truly bring joy! I made this in little bite sized molds (without the top layer since I didn’t have any sugar free chips). They turned out perfect...especially frozen! Thanks for making the holidays so much easier! Does this freeze well? Would I then defrost before serving? Yes. If you freeze in individual slices you can eat it frozen. I love it that way. This cheesecake was the best ever! I have made a LOT of THM desserts over the last year that I've been doing THM, and this is by far the very best one. I only made half of the recipe because I've learned that it's best to test and see if I'm going to like it before I spend a lot on ingredients as they are pricey, but now I wish I had have doubled the recipe instead! I'm curious as to what made you think to put baking soda in the mix? Nevertheless, it was amazing and I thank you for that!! I think another review stated that it deserved 6 our of five stars, and I agree! Just lots of time watching the food network over the years. Lol. The baking soda cuts bitterness. I don't remember when I learned that tip but it was probably from a cooking show. Could you make this in a square glass dish instead of the springform pan? Looks amazing! Yes, but you might not get neat pieces. It will still be delicious though! Can I leave out the gelatin on both the Crust and the filling? It will set pretty softly if you leave out the gelatin. You can but you won't get nice slices. I’m a little confused on the gelatin in the crust. Do you add water to it? Or just add the powder to the mixture? Just add the powder. It helps firm up the crust a little. It will absorb a little of the moisture from the other ingredients. 1. Is this like a light cream? or half and half? Is yes, then yes. 2. Yes 3. I don't know about this one. I've never used dry pressed cottage cheese. No, you don't whip the cream first. Yes, you can leave off the crust if you want. I made this for the developmentally house that I work at with 3 diabetics & 3 people on diets & oh my gosh, it was absolutely fantastic. So decadence & sinfully yummy. No one could believe it was sugar free until I should them all the sugar free items I used. I altered it a bit. For the crust I used a sugar free brownie mix I made the cheesecake part as listed except i used Splenda, only thing I had on hand. I used 30 packets. Also I didn’t have sour cream so I used a 1/2 cup of heavy whipping cream, but I whipped it first. As for the ganache I used a full bag of sugar free chocolate chips & 1 cup of heavy whipping cream. I was told the ganache tasted like a candy bar. I was requested by all of them & my co-workers to make it again for Thanksgiving & Christmas. Also I think it was so good that I am going to be making it again for my family for Thanksgiving, but using natural sugar items. This is a true keeper for me. Thanks so much for sharing this recipe. I am wanting to make this recipe, but am a little confused re gelatine. In your text you say not to use powdered gelatine, but the only gelatine I know is leaf or powdered gelatine, could you clarify please. I do use the powder gelatin. I use Knox brand. I just bloomed it (dissolved it) in this recipe instead of adding it as a powder right to the cream cheese. Sorry if that was confusing. Wow this recipe is AWESOME. 6 stars out of 5. My entire non keto family thought this was one of the best desserts ever. Highly recommended. I tried this and while it tasted very good, I didn't have an 8" springform pan. I think the one I have is 9 ". The cake was not as thick as the picture. I will try doubling the recipe and making again. It was very easy to make though. The absolute yummiest! I’m making it for the second time tonight! My apology. I found the answer in the recipe. What size and type of pan did you use for this cheese cake? It's sound yummy and I really want to try it. Today is the third time I've made this. My husband and oldest two kids (and myself!) LOVE it! My daughter was licking out the filling bowl and said, "It tastes so unhealthy!". And that is a huge compliment because it means she thinks it tastes like a dessert made with sugar. 😄 Thanks for an awesome recipe! Made this for my birthday "cake" today, and OH MY! It is soooooooo good, thank you! I have made several different THM style cheesecake recipes, but this is my favorite by far. I really like the no-bake crust much better than baked ones. And the filling is so creamy and the ganache is "over the top," LOL. The only "problem" so to speak is, I'm the only one in my family (me, husband, 91 yo m-i-l) who will be eating it, so it's a lot for one person. I think it should freeze well, since I plan to freeze at least half of it. I wish the others would try it, but they won't--their loss! I made this for myself but my family got into it as well. Darn! Anyway, we all loved it. I left off the ganache because I didn't have any sugar-free chips and didn't want to worry about what to sub for them. Even without the ganache, this cheesecake is amazing! So rich and chocolately! I will be making this again and again. But next time I'll hide it from the fam! Would ground golden flax be a good substitute for the almond flour? Ground flax doesn't taste very good raw. If you need this to be nut free I think ground sunflower seeds would work better. 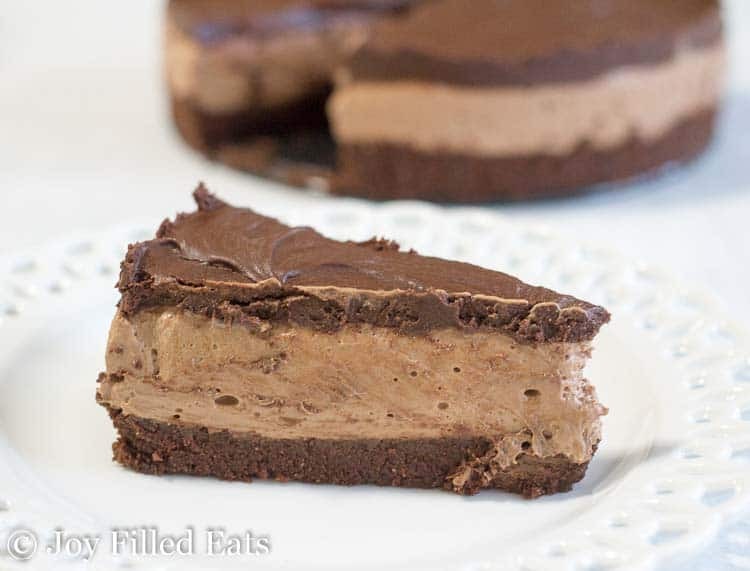 I so want to make the chocolate cheesecake filling into chocolate peanut butter cheesecake filling! Any ideas on how to accomplish this? Just add sugar free peanut? Yup! I'd just add a few big spoonfuls of peanut butter. I saw the ganache and I was hooked! 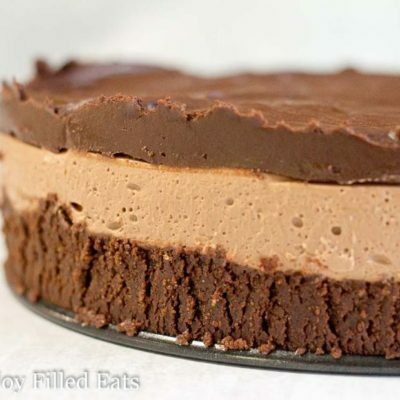 Need to try your chocolate cheesecake asap! 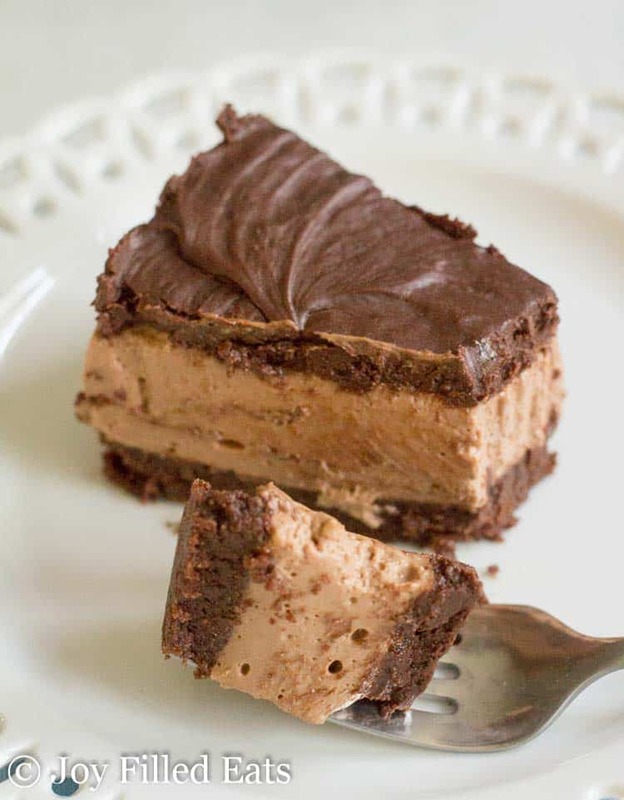 The layers in this chocolate cheesecake looks scrumptious! It's hard to believe this cake is a no bake dessert and low carb! Thanks for a great recipe! Just pinned and bookmarked. It is about 4.5 ounces. Try Safeway. They have krisda chocolate chips that are sweetened with stevia. They are a little pricy though. This looks delicious! Just to clarify… The gelatin in the crust does not need to bloom first? Nope, it helps the crust set a bit and adds a little protein. I love your recipes and this looks delicious! But I wish there were a good alternative to almond flour. My son is allergic to tree nuts and when he's home from college, I can't bake with almond flour. Coconut flour is just not a good substitute I've found - I don't like the texture or the taste. Any thoughts? Yes, I received a couple baking mixes that use sunflower seed flour. It's really good! It's on my to do list to try it in some baked goods of my own. The brand of mixes is Good Dee's.